Forever Pomesteen Power is a powerful antioxidant, contains Xanthones and has high ORAC value rating, all with a proprietary blend of fruit juices and extracts, including Pomegranate, Pear, Mangosteen, Raspberry, Blackberry, Blueberry and Grape Seed. Unique blend of fruit juices and extracts. Exotic flavor that everyone loves. There’s no disputing the fact that antioxidants are extremely vital to our health and well being. There is, however, much discussion today among nutritionists as to which fruit is the most powerful antioxidant, or which contains the most Xanthones or has the highest ORAC value rating. ORAC - Oxygen Radical Absorbance Capacity value is an indicator of how well an antioxidant inhibits free radical damage. The ORAC value of fruits can vary greatly, even when testing the same fruit at different times after harvesting. 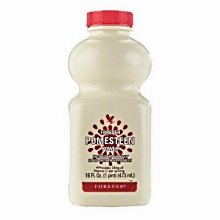 What is important to know is that all of the ingredients of Forever Pomesteen Power are near the top of the list in ORAC value, especially Pomegranate and Mangosteen fruit. Mangosteen is a popular fruit in Asia. Its exquisite taste prompted Queen Victoria to declare it her favorite fruit, henceforth it has been referred to as the "Queen of Fruits!" Its ORAC value is very high, and it is rich in beneficial Xanthones. Xanthones are a family of naturally occurring nutritional compounds in fruits that are super-powerful antioxidants. Take 1 fl. oz. (30 ml) daily or as desired, preferably before meals.